Past seven days: During the first part of the week, a high pressure system in the Tasman Sea maintained a ridge of high pressure along the east coast of Australia. This system combined with a series of upper level troughs and moist onshore flow to produce moderate showers over East Gippsland; and thunderstorms over southeast Queensland and eastern New South Wales. In the north, a humid easterly flow resulted in showers about the western coast of the Top End and Darwin region. By the middle of the week, a surface trough ahead of a cold front tracked across Victoria and Tasmania, producing light showers over southern Victoria and western Tasmania. Heavier falls were recorded through central southern Victoria. As it passed into the Tasman Sea east of New South Wales, the front combined with cloud associated with a surface level trough across Queensland, resulting in moderate showers and thunderstorms over southeast Queensland. In the last few days of the week, a low pressure system lingered near the west coast of Western Australia, with a broad trough extending into the interior of the State. Cloud and embedded thunderstorms accompanied the trough, with moderate totals reported in the coastal southwest Gascoyne, the southern Goldfields and Southeast Coast districts of Western Australia, with lighter falls across much of the west coast and southern Western Australia, reaching into southwest South Australia as these systems moved eastwards. At the same time, thunderstorms and moderate falls were experienced across greater southeast Queensland, from the Capricornia District to the Southeast District. Isolated rainfall totals exceeding 50mm were recorded in western Tasmania and southeast Queensland. The highest weekly total was 92 mm at Sunshine Coast Airport in southeast Queensland. Rainfall totals between 10mm and 50mm were recorded around the North Coast, Northern Tablelands and Northwest Slopes Districts of New South Wales; across eastern Victoria and a pocket of the west coast; along parts of the west coast and from the south coast to southern Goldfields District in Western Australia; southeast Queensland; western Tasmania; and the coast of the Darwin–Daly District in the Northern Territory. 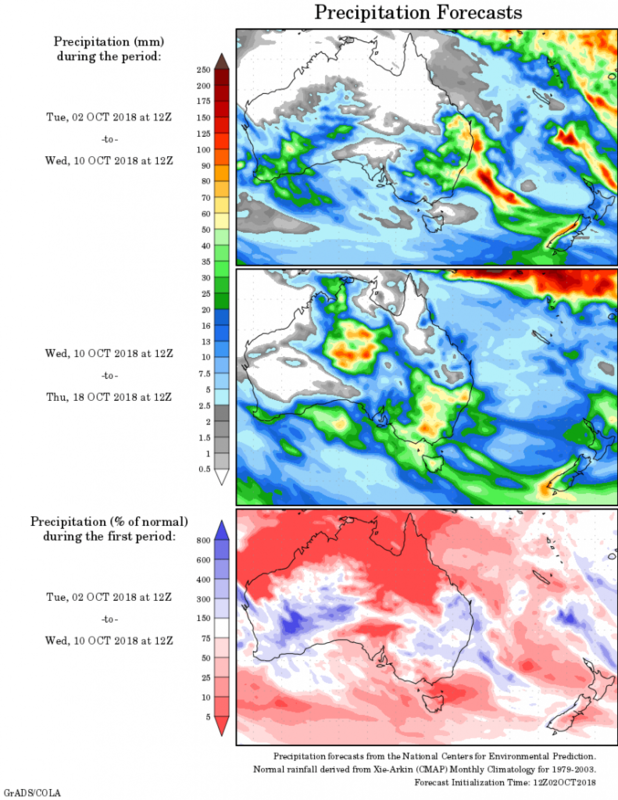 Little to no rainfall was observed over northern Western Australia; almost all of the Northern Territory; most of South Australia away from the south coast; northern inland Victoria; most of Queensland away from the southeast corner; New South Wales apart from the inland slopes and coastal region; and eastern Tasmania.